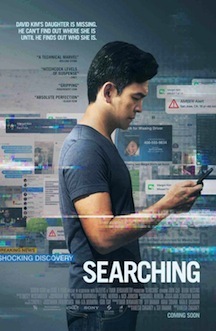 “Searching”, a low-budget, tech-based thriller directed by debutant Aneesh Chaganty, hinges on a catchy premise, advances with a so-so development, and waves bye-bye with a terrible resolution. The gimmicky story, co-written by Chaganty and Sev Ohanian, is set in San Jose, California, and follows David Kim (John Cho), an over-controlling single father who freaks out when his 16-year-old daughter, Margot (Michelle La), goes mysteriously missing. Within the first minutes of the film, through family videos, we learn that Margot’s mother, Pam (Sara Sohn), died from a lymphoma relapse. Two years have passed and Margot is now more independent, living her life without giving too much explanation to her dad. After the vanishing, David finds out she had canceled the piano classes six months before and made an unexplainable transfer of $2500 to a deactivated Venlo account. Managing to get several access codes and password recoveries, David dives in her Facebook page and gets in touch with her contacts, just to sadly realize they weren't exactly friends. The case is assigned to detective Rosemary Vick (Debra Messing - remember Grace Adler from “Will and Grace”? ), who first considers the chance of a ‘runaway teen case’ before concluding it was abduction. In the meantime, David keeps digging deeper in Margot’s social media accounts, which leads him to Barbosa Lake, a place she kept visiting for five months, and to the only person who she really maintained contact lately: Hannah, a young Pittsburgh waitress who uses fish_n_chips as web identity. The suspects change along the way, from Margot's colleagues to David’s own brother, Peter (Joseph Lee). Yet, to complicate things a little more, an ex-con confesses the murder before committing suicide. Do not worry, because the story doesn’t end here. Chaganty wanted his film to look intelligently cryptic, but what he achieved was just completely muddled. Moreover, the storyline is naive, contrived, and ultimately nonsensical, all aggravated by the utterly unconvincing performances from Cho and Messing. With my patience wearing thin, I remained seated just to confirm that “Searching” steeply declines as the mystery unravels. It's an emotionally parched, insubstantial drama thriller.